B&W image of Radio Shack TRS-80 Microcomputer System. It has a TRS-80 Video Display, Keyboard and tape cassette. The computer is on aounter in a business establishment. A man is behind the counter typing on the keyboard while a customer is on the other side with his wallet in his hand. To the right is a cash register. Recto bottom Margin: "Radio Shack TRS-80 Microcomputer System"
Verso:metadata " The answer to small business computerization is available now from Radio Shack. 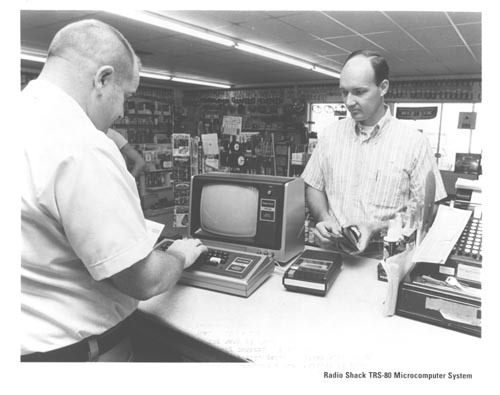 The nationwide electronics store chain has introduced their new Radio Shack TRS-80 Microcomputer System, a complete, low-cost microcomputer cabable of handling a wide variety of routine clerical functions such as payroll, general ledger accounting, accounts receivable and inventory control. Pre-recorded cassette programs will be available for many of these functions, and a comprehensive owner's manual will be supplied with the TRS-80 that will explain everything necessary for its operation from plugging it in through programming. . 7741B."